Is it an advantage in GPS sailing to sail as straight a course as possible? 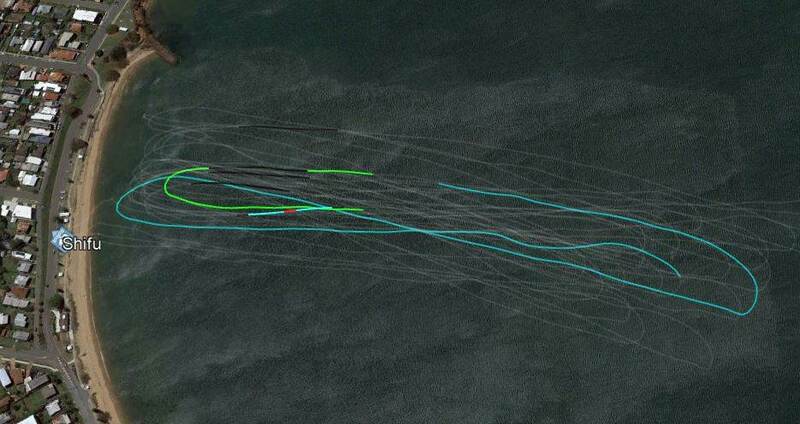 Besides having a couple of gybes in it, this track has a lot of course variations. This is mainly due to dodging big waves, but it does make me wonder where the line is between avoiding waves and sailing straight course in terms of obtaining best speeds. Is a straight course even necessary? Also, the Doppler speeds are measured on the course sailed, so it is your real speed, not the 'straight line between 2 fixed points' speed. On moderate wind speed runs, go deeper in the gusts and come up a bit in the lulls to keep the apparent wind higher. Same thing during a 1Hr or Half Hr. Best to avoid anything that will slow you down. Speed over time. Well, this is all good to know and I might experiment more with course variations to avoid waves when on the exit leg in alphas. These are straight into the waves at my spot. And don't expect the wind to be blowing from exactly the same direction all the time. The wind shifts are much more noticeable when going upwind really high, then you get "knocks" or "lifts". Yep. just be sure to make it back to inside the Proximity Circle (50M) or the Alpha won't register.